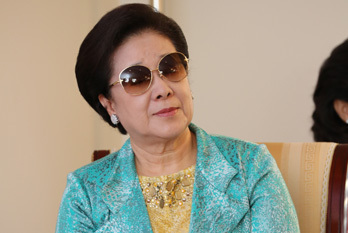 A Report of the Celebration of the 53rd Anniversary of True Parents’ Holy Wedding by Dr. Michael Balcomb in Las Vegas. 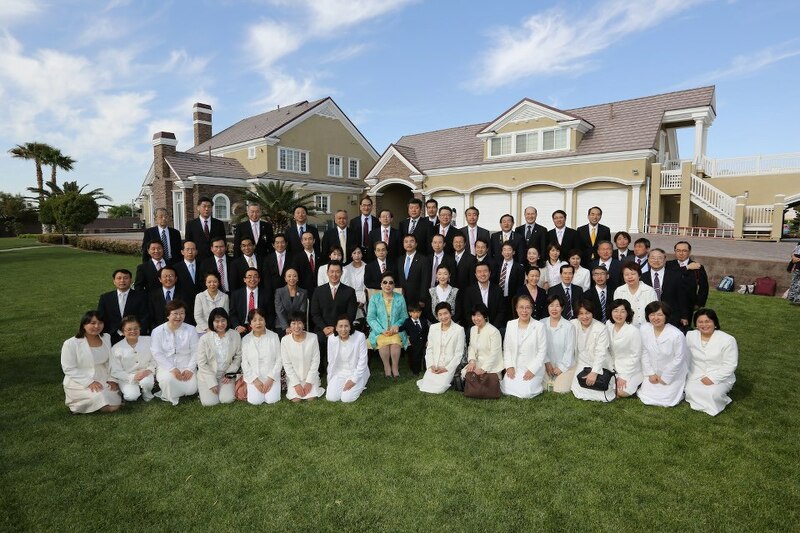 With the brilliant rays of sunshine shining in through the slats of the window blinds and filling the Las Vegas sanctuary with dappled light, a large group of brothers and sisters –, including members from the local community, representative leaders from around the nation, from Korea and more than a hundred from Japan – celebrated the 53rd Anniversary of True Parents’ Holy Wedding on April 25, 2013. It was a fine and most joyful occasion. Dr. Chang Shik Yang, our emcee, shared a few words and reflections from the historic event in 1960 and introduced a short but moving video of historical photos and footage from those days, including eyewitness testimonies from the elders of our church. Short and uplifting though her message was, by the end True Mother seemed to sense that some in the audience — including, I admit, your reporter—were beginning to cast hungry eyes on the beautiful offering table piled high with all kinds of fruits – apples, oranges, melons, bananas, and grapes –as well as rice cakes and other snacks. We were all suddenly and urgently reminded we’d already missed breakfast. 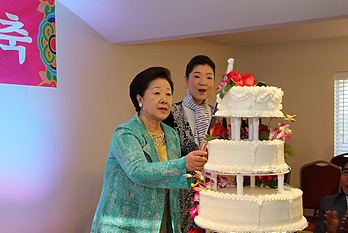 And so, before the entertainment began, Mother encouraged emcee Dr. Yang to have the offering table dismantled and distributed, leading the way herself by gently tossing a few tangerines into the hands of an increasingly enthusiastic crowd. I’ve never seen an offering table of fruit disappear so fast! 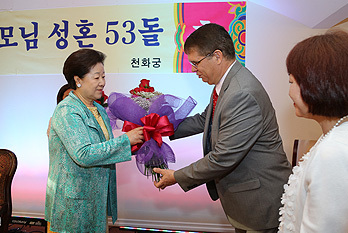 After that, the Korean and the Japanese delegations performed some traditional songs, and the Las Vegas second-generation choir sang Korean favorites Um Maya and Saranghae with delicacy and finesse. But I have to say – and I might just possibly be biased – the real hit was the American team singing “God Bless America” with great vigor and panache. Fumiko and I strongly felt True Father’s spirit in the room. Even the windows shook, and Mother and all the True Family members present sang along. It was just like old times. 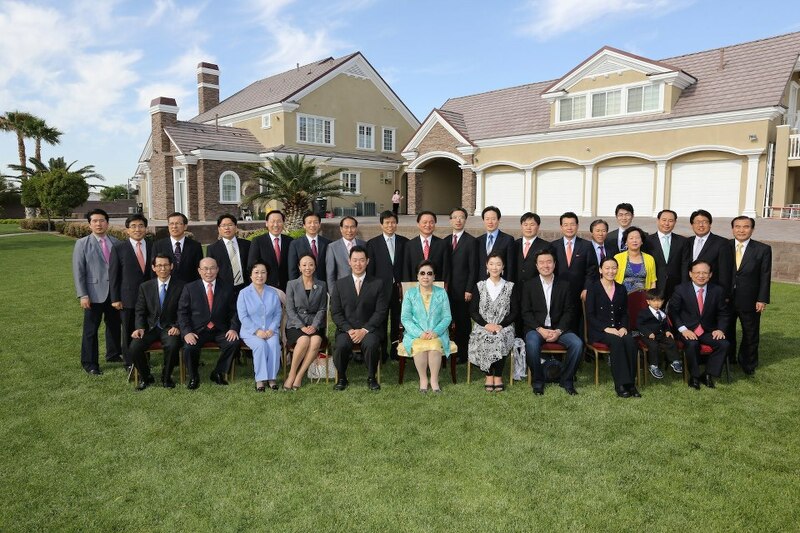 We concluded with songs from Kwon Jin Nim, who has been witnessing and doing service projects in Las Vegas since Foundation Day, and who also took the opportunity to invite everyone to join the Sunday services; then from Sun Jin Nim, and of course True Mother. 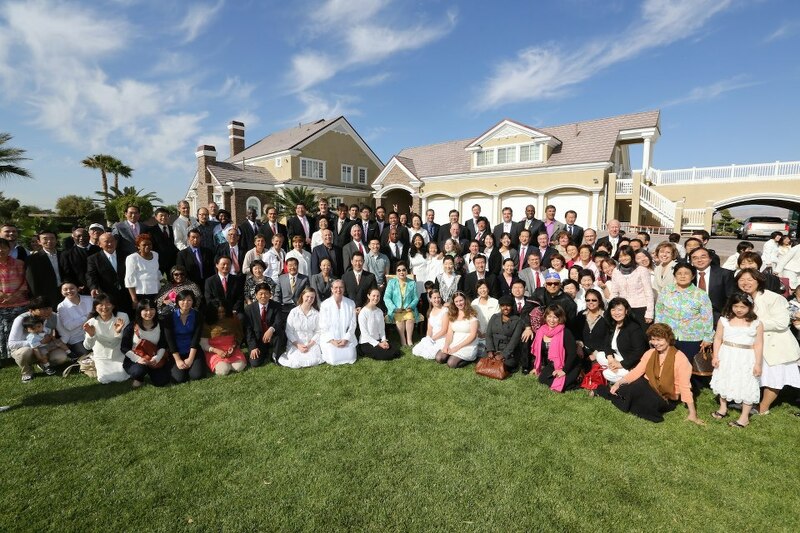 After the singing was over, and the three cheers of Og Mansei offered by Bishop Ki Hoon Kim, the call of the Spring morning outside was truly irresistible, and we all were invited to photos on the lawn in front of True Parents’ house. Thanks again to all those who participated, donated and helped to support this event with your prayers and your love, to those who came from far away to honor the occasion, and to all those who worked behind the scenes to prepare everything. Let’s continue to inspire True Parents with our love, determination and commitment.